Quickly tailor-make your perfect resume for any golden opportunity ahead in your life. Buy it now at an unbelievable price of $2690 $19 only at DealFuel. Professional and clean Layered files. 1 Pages 3 color (spot swatch) version (CS3) file. 3 Pages 3 colour (spot swatch) version (CS3) file. Not just this... There is something inside as a Bonus for you! 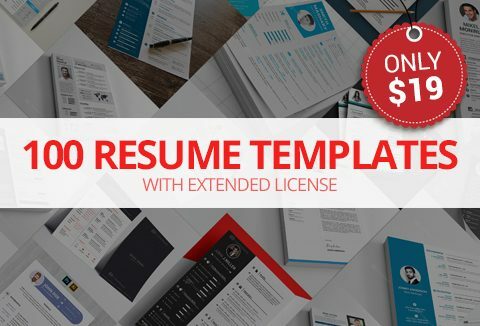 This bundle of 100 Best Resume Templates also includes an attractive (Resume + Cover Letter) Template. This deal comes with an Extended License. These best resume templates are compatible with Adobe Photoshop & MS Word. These clean modern Resume/CV Templates are the trendiest you can ever get on the web. Awesome bundle of resume templates. Value is way more worth the actual price so grab it before the offer is gone!